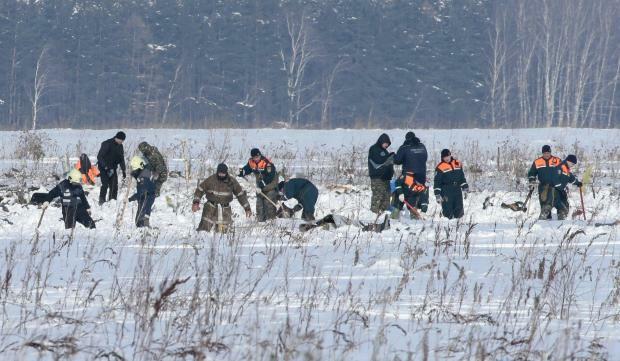 Emergency teams are searching snow-covered fields for human remains and debris after a Russian airliner crashed outside Moscow, killing all 71 people on board. The An-148 twin-engine internal flight, heading for Orsk in the southern Urals, went down minutes after taking off from Moscow\'s Domodedovo airport on Sunday. All 65 passengers and six crew on board were killed. Russian transport minister Maxim Sokolov said the search for victims\' remains will take a week. He added that the emergency teams have already found the plane\'s flight data recorder, which is crucial for determining the cause of the crash. The plane was operated by Saratov Airlines, which said the aircraft had undergone all the necessary checks. Russian Emergency Situations Ministry members work at the crash site of the AN-148 airplane in Moscow region. The An-148 twin-engine internal flight, heading for Orsk in the southern Urals, went down minutes after taking off from Moscow's Domodedovo airport on Sunday. Russian transport minister Maxim Sokolov said the search for victims' remains will take a week. He added that the emergency teams have already found the plane's flight data recorder, which is crucial for determining the cause of the crash.